Right click an empty space in the Layout or Drawing tab area, then choose Ribbon in the context menu. Easily switch between all open drawings. Drag and drop the tabs to change their order. Click the X at the right-hand side of tab to close it. Closes the current drawing (CLOSE command). Closes the drawings at the left of the current tab. Closes all drawings, but the current drawing. Closes all drawings (WCLOSEALL command). Displays the Open Drawing dialog (OPEN command). Displays the Create New Drawing dialog NEW command. Saves the current drawing (SAVE command). Saves all open drawings (SAVEALL command). Lets you choose the position of the document tabs. Saves a copy of the current drawing in a new tab, while keeping the original drawing open. Displays the Save As dialog. 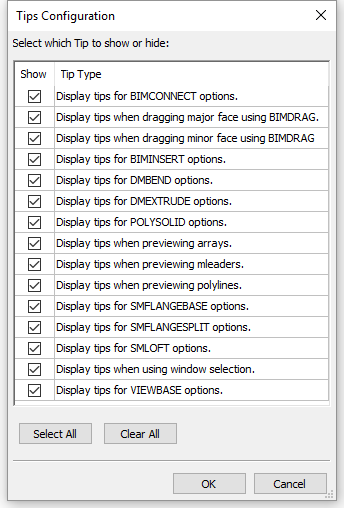 Opens the drawings that were open in the previous BricsCAD session. Opens the folder of the current drawing. Cascades the windows of the current drawings (WCASCADE command). Tiles the windows of the current drawings horizontally (WHTILE command). Tiles the windows of the current drawings vertically (WVTILE command). The display and location of document tabs is controlled through user preferences. In the Settings dialog go to Program Options / Display / Document tabs . ShowDocTabs : controls the display of document tabs. DocTabPosition : controls the location of the document tabs: top, bottom, left or right. Choose Command Bar in the View Menu. Move the cursor to a docked toolbar, then right click and choose Commandline in the context menu. Double click the Status field at the left hand side of the Status Bar . The Command Window closes if it was open and vice versa. Press and hold the left mouse button to move the commanline. Command History List field: the content of the history list field can be copied to the command edit field. If the Enable flag of the AUTOCOMPLETEMODE system variable is set, command entries are completed automatically as you type. All commands and/or system variables and/or user preferences that contain the current character string display in the Suggestion list. Press Enter if the currently completed command displays. Choose a command in the Suggestion list . You can modify the height of the docked command line by dragging its top or bottom edge, depending on its docking position, bottom or top. The size of a floating command line can be adjusted by dragging one of its edges. Use the arrow-up and arrow-down keys of the keyboard to browse the command history. Command options and keyboard entries display in the status bar. Press the F2 function key to toggle the Command History window. The CLIPROMPTLINES system variable sets the number of command history lines that display shortly at the bottom of the graphics window. Set CLIPROMPTLINES=0 to disable this feature. Go to Program Options / User Preferences / Command Line. Choose Status Bar in the View Menu. Press the Shift + F3 keyboard shortcut. The Status Bar closes if it was open and vice versa. displays the status of the software. when the cursor is in a menu or on a toolbar: gives a brief description of the tool or menu item under the cursor. when the command window is closed: displays the command prompts, tool options and keyboard entry. double click the status field to open/close the Commandline. Click the arrow button ( ) to display a list of available Status Bar fields. Click an item in the list to toggle the display of the corresponding field in the Status Bar . Cursor coordinate values : displays the coordinates of the current cursor position (depending on the setting of the COORDS variable). Click to cycle the Coordinate setting. The sequence is Geopgraphic , Relative , Absolute, Off. 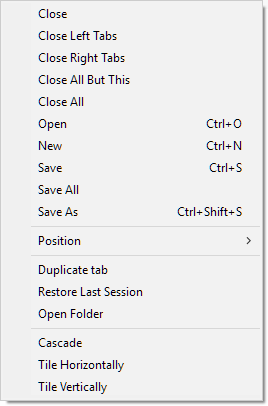 Right click, then choose an option in the context menu. Current Layer : displays the name of the current layer. Click to open the Layer Explorer . Right click to select the current layer in the context menu. Right click and choose Properties in the context menu to open the Drawing Explorer - Layers. Current Color : displays the current color. Click to open the Select Color dialog window. 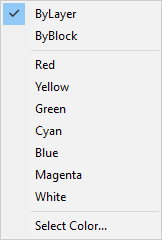 Right click to select one of the basic colors. Right click and choose Select Color... to select a color. Current Linetype : displays the name of the current linetype. Click to open the Linetype Explorer . Right click to select the current linetype. 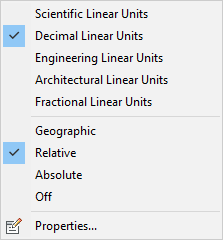 Right click and choose Properties in the context menu to open the Drawing Explorer - Linetypes. Current Text Style : displays the name of the current text style. Click to open the Styles Explorer . Right click to select the current text style. Right click and choose Properties in the context menu to open the Drawing Explorer - Text Styles. Click to open the Dimensions Settings dialog window. Right click to select the current dimension style. Right click and choose Properties in the context menu to open the Drawing Explorer - Dimension Styles. Current Work Space : Indicates the current workspace. Click to set the value of the WSCURRENT system variable in the commandline. Right click, then select the current workspace. Choose Customize in the context menu to open the Customize - Workspaces dialog box. Snap : Toggles the SNAPMODE system variable. Click to toggle Snap On ( ) / Off ( ). Right click, then choose Settings to edit the Snap and Grid settings. Grid : Toggles the GRIDMODE system variable. Click to toggle the display of the GridOn ( ) / Off ( ) in the current viewport. Ortho : Toggles the ORTHOMODE system variable; turning Orthogonal mode on automatically disables Polar Tracking. Click to toggle Orthogonal mode On ( ) /Off ( ). Right click, then choose Settings to edit the Orthomode setting. Polar : Toggles the Polar Tracking option of the AUTOSNAP system variable. Click to toggle Polar Tracking On ( ) / Off ( ). Turning Polar Tracking on automatically disables Orthogonal mode . Right click, then choose Settings to edit the Polar Tracking settings. Esnap : Toggles the Turn of all snaps option of the OSMODE system variable. Click to toggle Entity Snaps On ( ) / Off ( ). Right click, then choose Settings to edit the Entity Snaps settings. Strack : Toggles the Entity Snap Tracking option of the AUTOSNAP system variable. Click to toggle Snap Tracking On ( ) / Off ( ). Right click, then choose Settings to edit the Snap Tracking settings. Lineweight (LWT) : Toggles the LWDISPLAY system variable. Click to toggle the display of Line Weights On ( ) or Off ( ). Right click, then choose Settings to edit the Lineweights settings. 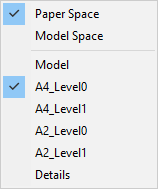 Paper/Model: Allows to choose between model space and paper space. When working in Model Space, the field reads: Tile (= Model space with tiled viewports). Click to switch to the most recently opened paper space layout. Click to toggle between paper space and model space with floating viewports. Layout : Switch to the selected paper space layout. Select an annotation scale in the list. Choose Custom to launch the SCALELISTEDIT command. 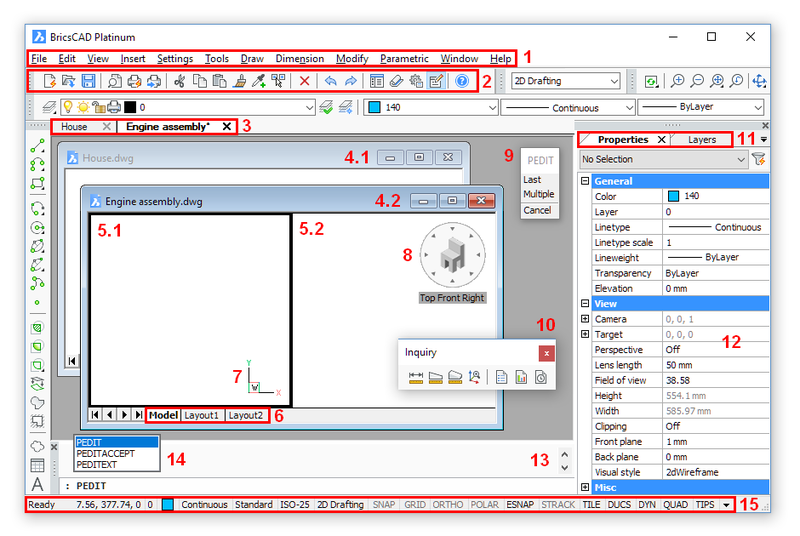 Check the Hide Xef scales option to list annotation scales of the current drawing only. Autoscale : Click to toggle the ANNOAUTOSCALE system variable. Tablet : Initializes the use of a drawing tablet. Dynamic UCS (DUCS) : Click to toggle the UCSDETECT system variable On ( ) or Off ( ). Dynamic Input (DYN) : Toggles the Switch all off temporarily option of the DYNMODE system variable. Click to toggle the display of Dynamic Dimensions On ( ) or Off ( ). Right click, then choose Settings to edit the Dynamic Dimensions settings. Quad : Toggles the Switch off option of the QUADDISPLAY system variable. Click to toggle the display of the Quad On ( ) or Off ( ). 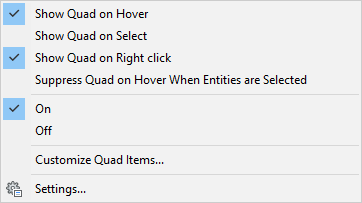 Right click, then choose Settings to edit the Quad settings. Rollover tips (RT) : Toggles the ROLLOVERTIPS system variable. Click to toggle the display of rollover tips. Right click to select the display options for rollover tips: On hovering entities or No rollover tips . Tips : Toggles the TIPS system variable. If TIPS = ON, an assistant widget reveals options available using the Ctrl-key. Tips when creating polysolids . Click to toggle the display of the TIPS widget On/off. Click On or Off to set the display of the the TIPS widget. Click Configure to display the Tips Configuration dialog. Select which tips show when TIPS = ON. Lock User Interface: Allows to lock the location and size of toolbars and dockable panels. Press Ctrl to override. Click the LOCKUI field to toggle the lock. Press Ctrl to override. Which user interface elements are affected is controlled through the LOCKUI system variable. GIS Coordinate Sytem : Displays the name of the current GIS coordinate system. (option) Hold down the Shift key, then press the F4 function key. (option) Choose Scroll Bars in the View menu. type off in the command bar or choose Off in the context menu. type on in the command bar or choose On in the context menu. type T in the command bar or choose Toggle in the context menu. Use the -TOOLPANEL command to show, hide or toggle the display of the various tool panels. The CLEANSCREENON and CLEANSCREENOFF commands allow to hide or show a selection of user interface elements simultaneously. Which user interface elements are affected by these commands is defined by the CLEANSCREENOPTIONS system variable. The Ctrl+0 keyboard shortcut toggles the display of user interface elements. On AZERTY-keyboards: do not use the numeric keypad; do not press the Shift-key when hitting the number key.